Coffee is on. Better temps today, back to 70 tomorrow. Thanks for the coffee. I was sore and tired all weekend from the weed pulling marathon I did in the garden on Friday. Having the grand daughters plus a friend all weekend gave me a chance to rest up so I can go out today and hit it again. 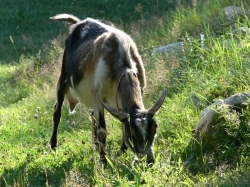 I took wagon loads of Poor Joe, fescue, lamb's quarters, clover plus other weeds to the sheep and they ate it up. Yesterday we took the girls out to the area that we have been working on to get cleaned up and picked up branches, sticks and small stuff. We made 4 loads in the mule. The 2 year old brought me a stick and said, "That's enough." Then Russell came over and laid down a bunch of small trees, limbed them and stacked them up so we can cut them for firewood for DD and her family. I stuffed the ewes full of hay before I turned them loose on the tops. Going for another cup of coffee. Bruce, Rammy, CntryBoy777 and 1 other person like this. We had snow Friday and Sunday, and some hail too. The varied thrush is back, so even with the pond iced over....SPRING! Kids are running out now to tap the birch tree. B&B Happy goats, Baymule, CntryBoy777 and 2 others like this. We had some of the storm system that moved North from TX and did so much damage from several tornadoes. So Sunday night it slid in, NE direction. About 3 AM Monday morning I was awakened with the blowing & howling. Didn't hear the rain due to all that but, we got our share! This morning things were everywhere they didn't need to be including 3 animals. Got them back where they belonged and took care of closing where the storm had opened. Just a broken barn door latch and a fence post. All is good.... Yeah, sure needed coffee this morning. News/weather said 73 mph winds in our area last night & will maintain about 30 all day. DDs duck hatched at least 10 ducklings. 5 more eggs still there. Don't know if pipping or not -- haven't been to the duck area and they aren't mine anyway. I'm sure they're cute as all ducklings ARE! I'll check them out tomorrow. He says, the hen won't mess with the littles and "runs from them" LOL. I told him to stay away and let her finish the job and she will take care of them! I was out checking on goats when they came to the barn to tell me. Of course, they were carrying flash lights and felt it necessary to shine the things into the goats and get them all up. Had to "remind" them to shine it up to reflect from metal, no one needed it in their eyes. Yeah, dog & cat people. Any way -- no one was trying to kid right then. Have one within about 36 hrs & was doing a "bed check" on her. Another within the week, it appears. Last 3 are looking like early to mid May. With the warm weather and more than ample rain, grass is surging along -- warm weather types are happily awakening! It's sure greening up all over now, not just patchy cool weather areas. NICE because decent hay has gotten hard to find. Won't need much now except for any stalled goats during kidding. B&B Happy goats, Rammy, Baymule and 2 others like this. Good morning all! No coffee for me until after labs this morning. Going to be nice here in Iowa today. Looking at close to 70. Planning on just checking on the ducklings and chickens until DS3 comes home and an do chores for me. B&B Happy goats, Mini Horses, Baymule and 1 other person like this. Coffee is on.. got to get chorse done and horses loaded then off to the state park for a morning ride. Wehner Homestead, CntryBoy777, Rammy and 2 others like this. Thanks for the coffee PA. This morning we go to town, get a few grocery items, go by TSC, run errands, then back home and we'll clean up the tops and mess from having trees cut on Sunday. promiseacres, CntryBoy777, Rammy and 1 other person like this. Good morning y'all. Thanks for coffee. The sun is out and it's going to be in the high 50's today. Tomorrow will be a bit better then it will rain for the rest of the week. Morning. Have ten duckies hatched so far. One isn't doing too well, though. I had to help it out of the shell as it seemed to be shrink wrapped a little. It bled some but the bleeding has stopped. Just a little weak. Going to give him/her some nutridrench when I get home. Got it in its own brooder until it gets better. Seemed a little more perky this morning. Wehner Homestead, Mini Horses, Bruce and 3 others like this. Here it's lovely out! Sunshine, mid 40s and climbing to low 70s, light breeze. Pretty nice out there The kids are jumping and running, cute to watch. Can confirm 3 broodies! Yeah, been waiting to be sure...I'm sure. Each has 4 eggs -- 2 also have a golf ball -- So I will set up a controlled, secure area and move them into pens one night this week. I had been removing eggs so the ones under each are all "about" the same lay & set date. When I move them, one will get all the eggs and other two will get some I am collecting now. That way, one will hatch out 7-10 days ahead, others about same time couple of weeks later. Mainly, not wanting to "waste" time and hens for only 4 chicks each, at most. May actually buy a dozen eggs from a local raiser. Making contacts for availability. Heading to work in a few. Everyone enjoy your day! Wehner Homestead, promiseacres, CntryBoy777 and 2 others like this.